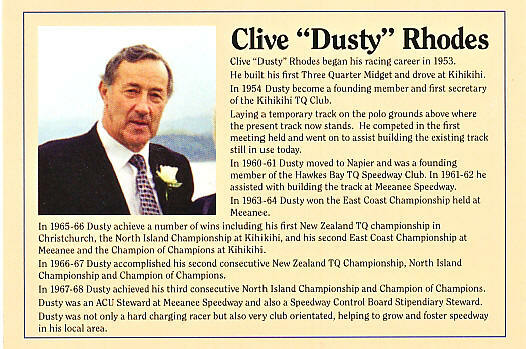 Many thanks to Reece and Marcel Facoory for help with this page. 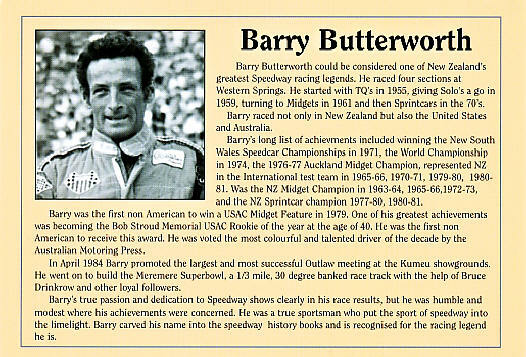 The Bruce Drinkrow Memorial Speedway Hall of Fame was formed as an Incorporated Society of New Zealand in 2003. It has a Constitution and consists of 15 Executive members. The driving force behind it has been Reece Facoory, who after a two year effort to set up rules and constitution finally made it all happen. 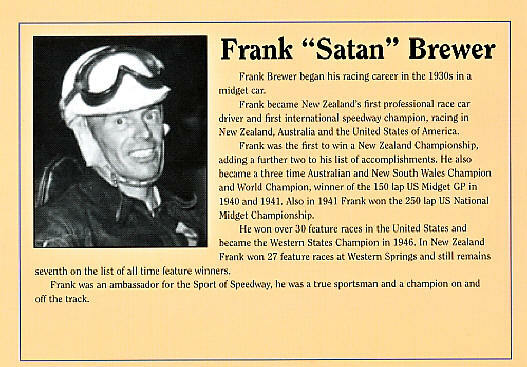 The main sponsor for the hall is the Drinkrow family of Auckland. 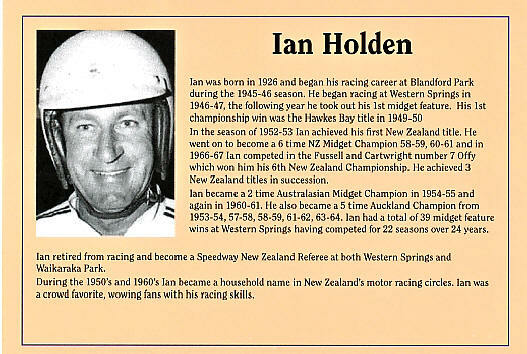 The purpose of the NZ Hall of Fame is to recognise people, whether they be competitors, officials, race car owners, club stalwarts, people who may have won World Championships, to people who have given their life time of service to our sport at club level. From the 15 Executive members, five members each year are selected to be the judging panel. The five judges do not know who the other Judges on the panel are, thus preventing block voting. See 'photo cards' below for details on each person. 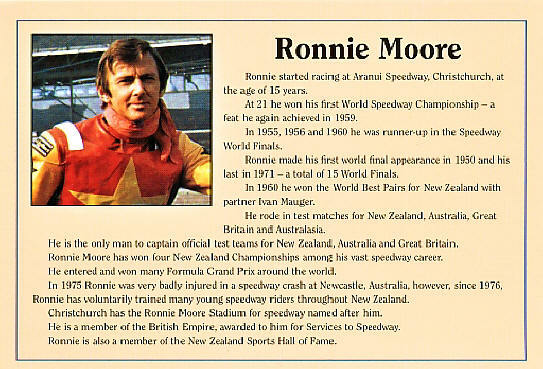 Ronnie Moore OBE Speedway World Champion 1954, 59. 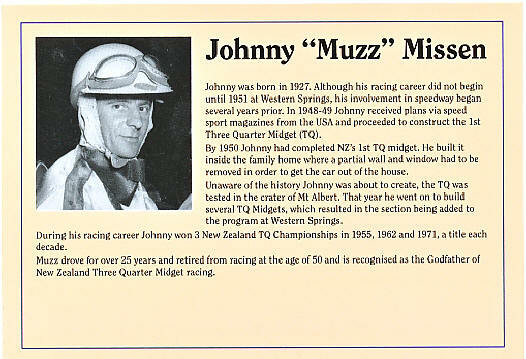 NZ Champion 1956, 62, 68, 69. 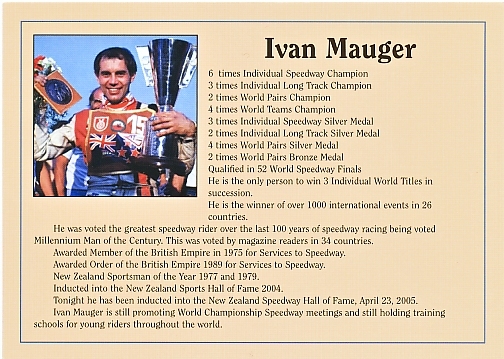 Ivan Mauger OBE MBE Speedway World Champion 1968,69,70,72,77,79. 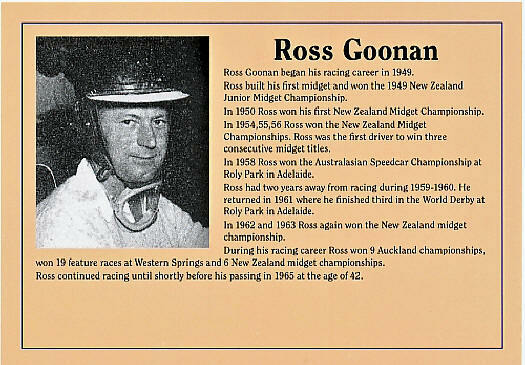 NZ Champion 1974, 81. 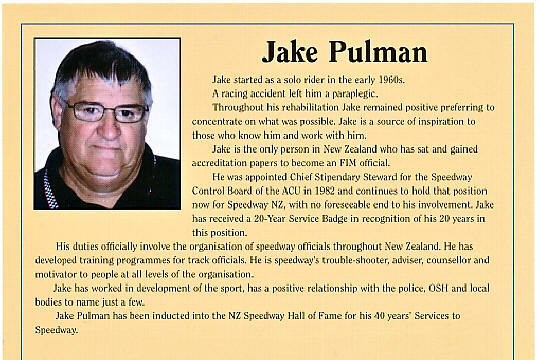 Jake Pulman - Competitor / life time Speedway NZ official. 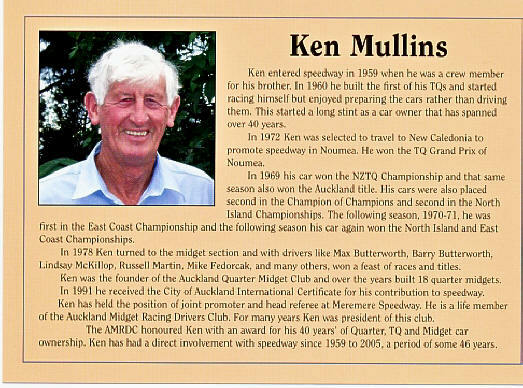 Ken Mullins - Competitor Car owner / Auckland club life member. 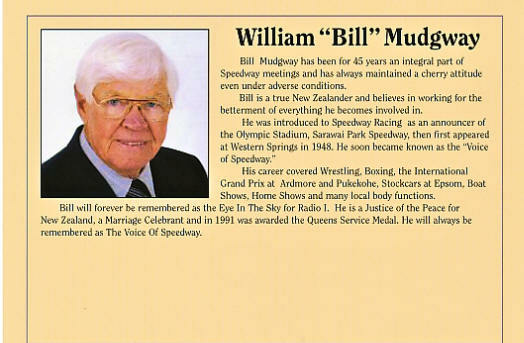 Bill Mudgway— Life time official, announcer at Western Springs on and off from 1951 to 1988. 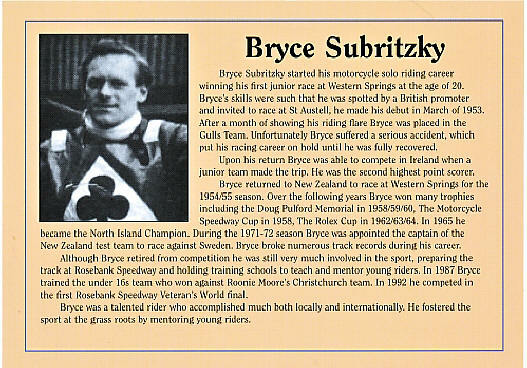 Bryce Subritzky NZ Champion / NZ Test rider / mentor to young riders. 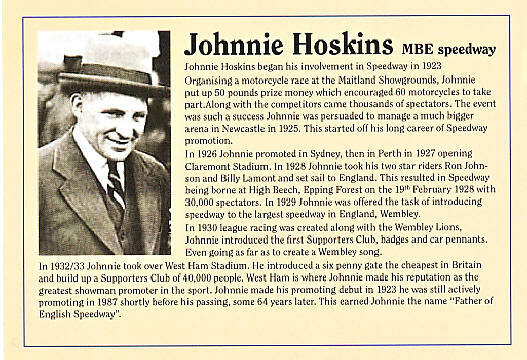 He rode for Long Eaton in UK in 1964. 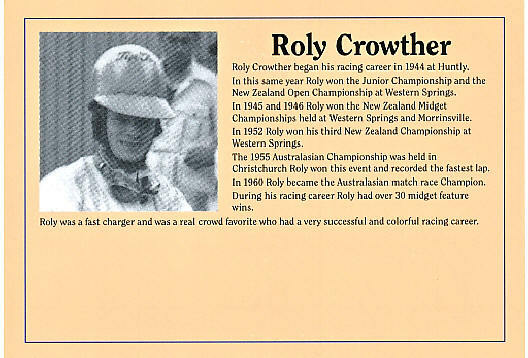 Roly Crowther 1945,46,52 NZ Midget Champion / Outstanding achievements. 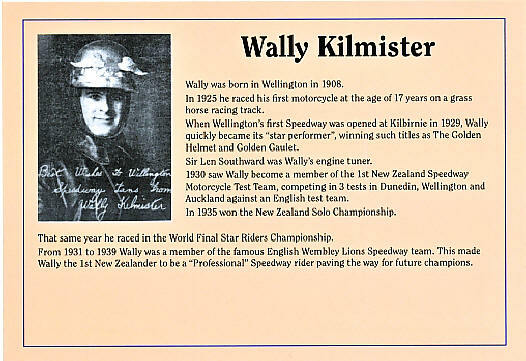 Wally Kilmister NZ Solo Champion 1936, First professional rider in NZ, Rode for Wembley 1931 to 39. 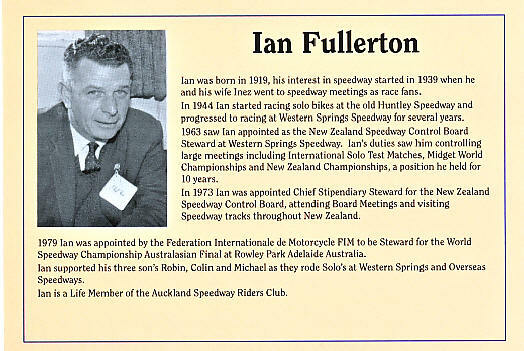 Ian Fullerton 25 years service to Speedway. ACU, FIM, Speedway Control Board.